Product #45611 | SKU DRL1500FB2LK | 0.0 (no ratings yet) Thanks for your rating! Dracast has put together the Silver Series LED1500 Foldable Bi-Color LED 2-Light Kit to offer photographers a 2-point light solution for the studio or the road. 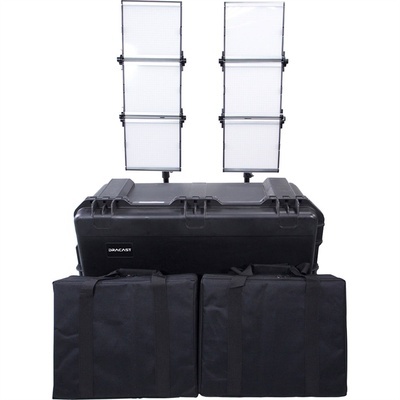 The kit comes with 2 Silver Series LED1500 Foldable Bi-Color panels, each with a multi-voltage AC adapter, a V-Mount battery plate and a light stand. The Silver Series Panels from Dracast are the slimmest, lightest Dracast LED panels to date. We've taken the classic panel form factor and tweaked it to bring you an ultra-portable, ultra-versatile light fixture that's ready to shoot where you do. Silver Series lights can be battery powered for field work and generate little to no heat, making them ideal when portability is a must. The Silver Series lights are are still some of the most durable LED lights available, being built entorely on an anodized aluminum frame and chassis.